In Lourdes, France, in 1844 a baby girl named Bernadette Soubirous was born. Bernadette’s family was very poor, and Bernadette was responsible for looking after and caring for her brothers and sisters. Bernadette was a good natured girl with dark eyes and a round face. The only education Bernadette received was the Catholic teachings which she studied faithfully in the evenings. At the age of 13, Bernadette was preparing for her First Holy Communion. One of Bernadette’s chores was to collect wood for the fire. On a cold day in February 1858, Bernadette and 2 companions headed off to the Gave River to collect pieces of wood. The 2 companions ran ahead and left Bernadette struggling to keep up. As Bernadette was taking off her shoes to make her way through the river, she was startled by a peculiar wind and rustling sound. Bernadette looked up towards the grotto and the caves on the riverbank. Near the opening of the grotto, Bernadette glanced and noticed the cave was suddenly filled with golden light. Lifting up her eyes, she saw a lady of great beauty, dressed in a pure white robe with a blue sash, a veil over her head, a rosary clasped in her hands and yellow roses at her feet. Bernadette rubbed her eyes. What a beautiful lady! But where did she come from? And what was she doing here? The beautiful lady smiled at Bernadette and asked her to say her rosary. Bernadette said her prayers and when she was finished she looked up, the lady had vanished. Bernadette caught up to her 2 friends and discovered that they were upset with her. What have you been doing? Playing in the river, while we are out here collecting wood? Bernadette told them about the vision she had just witnessed. The girls told Bernadette she was silly and probably just seeing things. Bernadette felt drawn to the grotto and returned there on the next Sunday. Again Bernadette saw the beautiful lady. The third time Bernadette went to the grotto, the lady spoke to her. The beautiful lady asked Bernadette to come here every day for fifteen days. She said that she wanted Bernadette to tell the priests to build a chapel there. She told her to drink water from the stream. The lady also told Bernadette to pray for the conversion of sinners. Bernadette followed the requests. On March 25, the Lady finally told Bernadette that she was Mary, the mother of Jesus, and that her purpose in appearing to Bernadette was to warn her to pray and make sacrifices for sinners. The miracles of body and soul performed at Lourdes are the proof that this message was a true warning from the queen of heaven to her children and that she was deeply interested in their welfare. Bernadette’s daily visits to the grotto caused quite a stir in the countryside. Crowds of people began to gather and watch Bernadette as she examined the cave and obediently did the things the lady asked of her. They watched Bernadette scrape away soil beside the grotto until a spring of water started to trickle out. Would you believe this spring still provides 27,000 gallons of water everyday! This is the sacred Lourdes water which heals all! At first, the priests, the town’s folk, and the families doubted Bernadette’s visions and the purpose in her activities. But Bernadette was stubborn and determined to follow Mary’s plans for her. 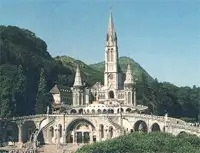 Eventually everyone did believe Bernadette and the grotto at Lourdes became a place of worship and the Lourdes holy water was sacred for performing miracles. At the age of 22, Bernadette became a nun and devoted her life to Mary, to praying for the conversion of sinners and to the service of God. 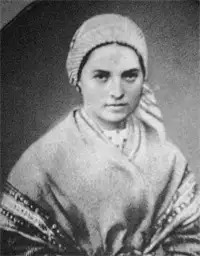 Bernadette died on April 16, 1879, at the age of 36. She will be remembered for believing in the greater glory of God as she was faithful to her mission, she was humble in glory and she was valiant in her sufferings. Today, Lourdes remains one of the most frequented Christian shrines in the world. More than 3 million visitors, pilgrims and tourists come each year to the Grotto of Massabielle, where the Virgin Mary appeared to Bernadette 18 times in 1858. Estrade recorded a conversation between the Chief of Police and Bernadette. During that meeting, M. Jacomet deliberately tried to confuse Bernadette to change her account of the apparitions. When that attempt failed, the Chief of Police released Bernadette to the custody of her father with an admonition that he take her home and guarantee that there would be no further disturbances. But the interior call which was urging her on was stronger than any earthly admonition. Bernadette joined the order of the Sisters of Charity. Throughout her life she remained sickly, but attended patiently to her duties as infirmarian and sacristan. She died a holy death on April 16, 1879. She was 34 years old. Bernadette was buried on the convent grounds in Nevers, France. Her body was exhumed thirty years later on September 22, 1909, in the presence of two doctors, several appointed officials, and nuns from the local convent. When Bernadette's coffin was opened, there was no odor, and her body was completely untouched by the laws of nature. A second exhumation took place on April 3, 1919. The body of the then declared Venerable was found in the same state of preservation as ten years earlier, except that the face was slightly discolored, due to the washing it had undergone during the first exhumation. A worker in wax was entrusted with the task of coating the face of the Saint who had been dead forty years. The sacred relic (Bernadette's body) was placed in a coffin of gold and glass and can be viewed to this very day in the Chapel of Saint Bernadette at the motherhouse in Nevers, France. Today, around the grotto, a neo-Byzantine, three-level basilica was built. Underground is another basilica, which holds 7,000 people and has a ramp for wheelchairs. The baths, the real focal point of the shrine, are small cubicles full of ice-cold water from the spring, in which the sick, some terminally ill, immerse themselves in hopes of being healed. Two hospitals, which care for but do not treat the sick, are part of the complex. Of the 3 million individuals who come to Lourdes every year, 500,000 are sick people hoping to be cured miraculously. Recent data from the Lourdes Bureau Médical, 66 cases have officially been acknowledged as miraculous, from 1858 to nowadays; from the first case occurring a few days after the first apparition at Massabielle, to the last case, relating to Mr. Jean-Pierre Bély, acknowledged in 1999, versus an overall number of 7000 recoveries claimed. Claims of miracles must go through the study of one of the most strict group of physicians. In fact, the Lourdes National Medical Committee was established in 1947, made up by university specialists, in order for a more rigorous and independent control to better guarantee the authenticity of the possible miracles. This committee became International (LIMC) in 1954, thus acquiring even greater authority and a universal dimensions. At present, the Lourdes International Medical Committee (LIMC,) based in Paris, is made up by 25 members, including physicians of international renown, university professors and experienced and qualified medical practitioners, from different countries worldwide. There must be medical proof that the sick person was indeed sick to begin with, that the symptoms disappeared within hours, and that the cure lasted for several years. The patient is examined on the spot by a medical bureau, which sends its conclusions to LIMC. If the commission regards the cure as authentic, the report goes to a canonical commission in the diocese from which the cured person came, and the bishop makes a pronouncement on it. Only then the recovery is officially proclaimed a miracle.